Note: I actually own this sweater. 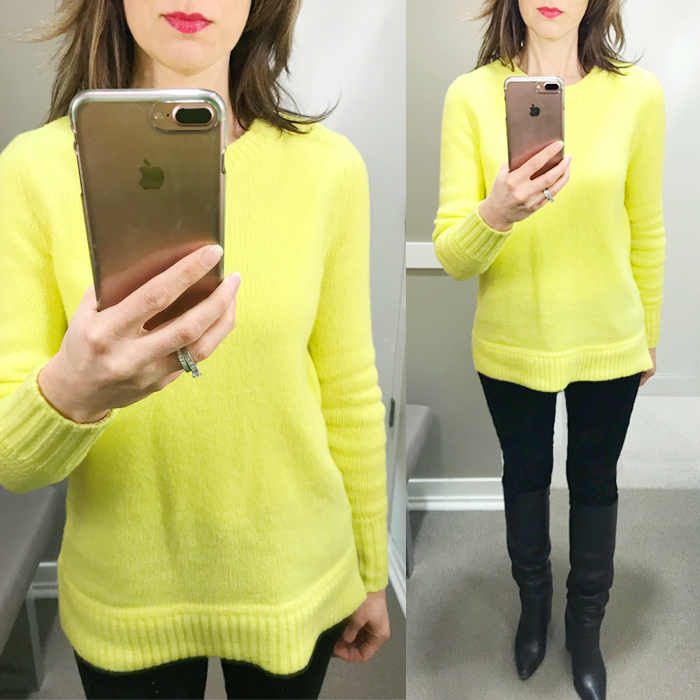 I debated keeping the sweater because it was so bright yellow - but glad I did. It is a bit of sunshine during winter! 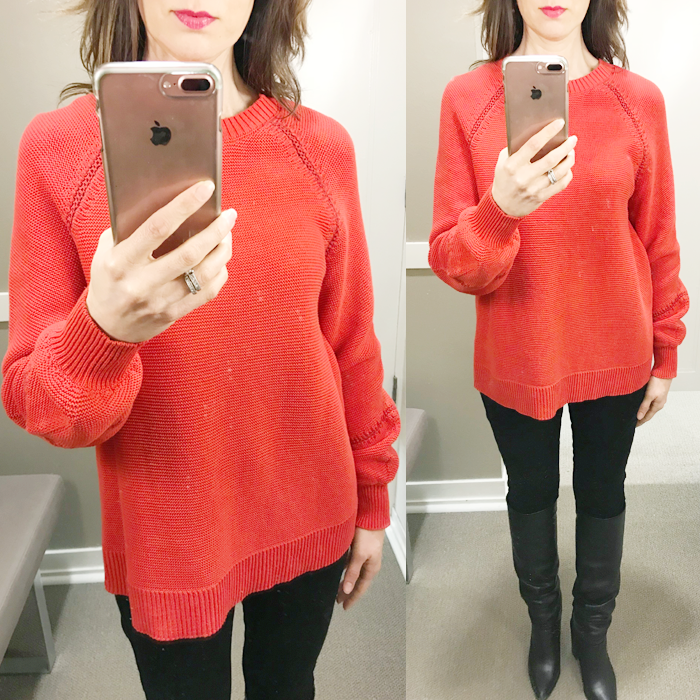 I shared the striped version of that sweater in last weeks try on HERE. Both cute (and comfortable) sweaters. 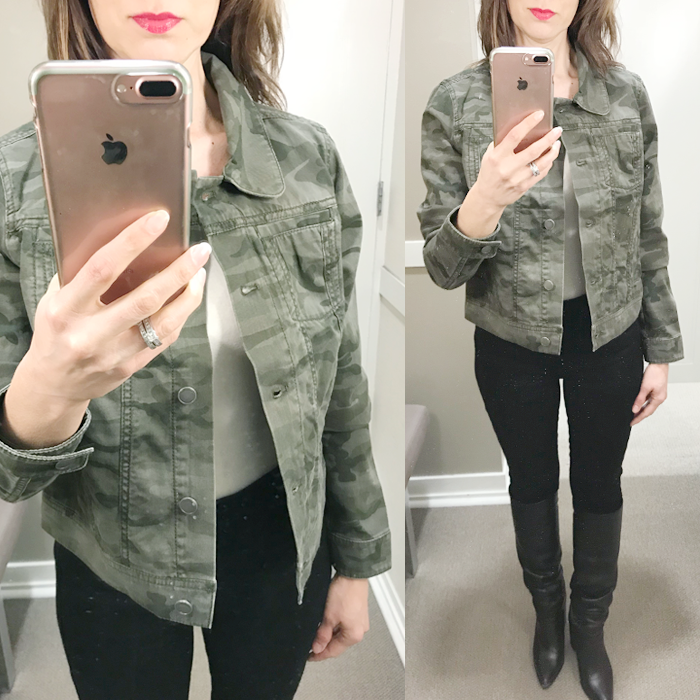 I have looked at the camo denim jacket online for a few weeks - but when I tried it on in the store - I really liked it! I highly recommend it - if you like camo and denim jackets. It is a great combo. I also love "dayglow" yellow sweater. I think it pairs so well with black. And, it adds a little "sunshine" to the dreary winter, plus it is 60% off! 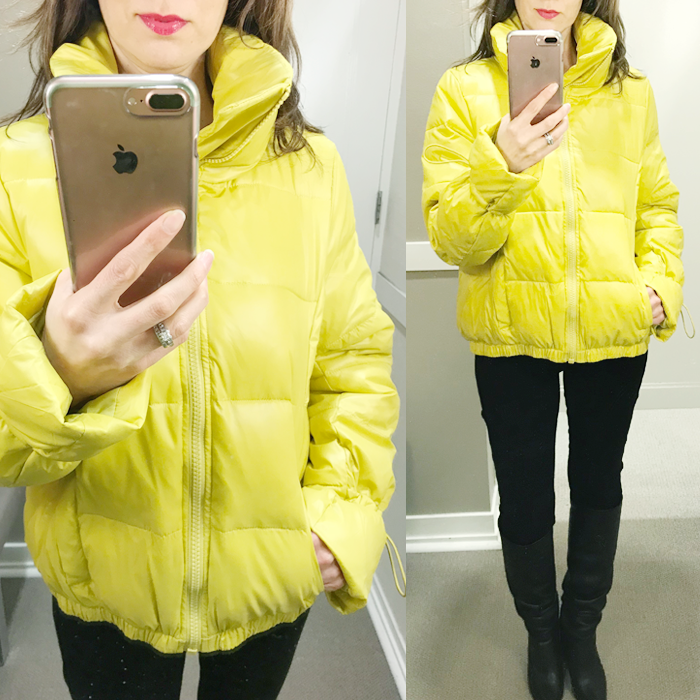 And, that bright yellow puffer jacket - is an additional 70% off! These are the cutest pink suede slides with pearl accents and they are only $42! This cute new arrival “flounced” shirt. This cute striped one shoulder ruffle top is marked down to $15. This draped faux suede jacket (in three colors) is 50% off and under $50. The popular suede moto jacket comes in a new “winter white” color. I like the color of this trench coat - and it's a good price. 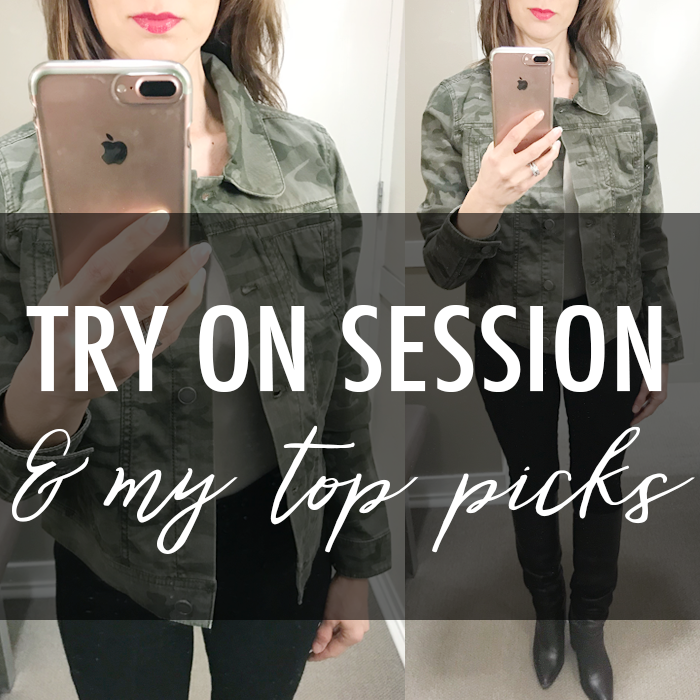 I love this structured cargo jacket - and especially how it is styled. These are cute suede ankle booties - with a fun twist - and they are a great price! A pretty floral cardigan - perfect for Saturday errands. This blouse would be so cute styled for spring - but it kind of reminds me of a “candy striper”, which does anyone know what I am referring to? Click HERE if you are curious. Be sure to link up your fashion posts at our TBB Style Link Up on The Blended Blog. So I love my little camo coat but I've been thinking of cutting it off to be short. Thanks for the inspiration! I am loving that camo jacket! 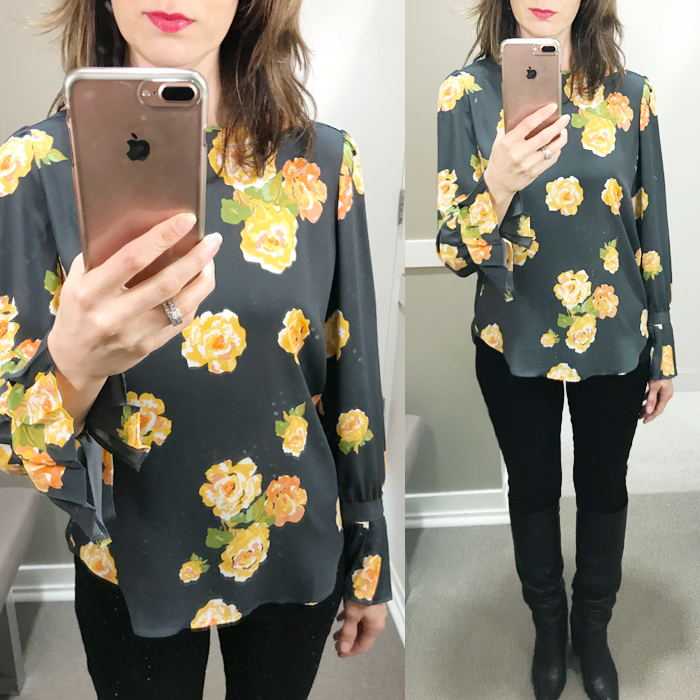 What a fun piece to have in your closet, especially with Spring hopefully around the corner. Those pink mules with the pearl accent are super cute! You rounded up such great items, I want everything - even the candy striper top, lol! Also, what kind of lipstick do you use? It looks perfect on you. I'm on the hunt for a great, long wearing lipstick. Hope you don't mind me asking. I don't mind you asking at all - I'm glad you did! It is Dangerously Red by MAC - I linked it under the yellow sweater at the top. I got it with the Christmas trio sets. So many cute finds! Love all the bright colored tops! Love that yellow puffer jacket and that camo denim jacket. Great finds! 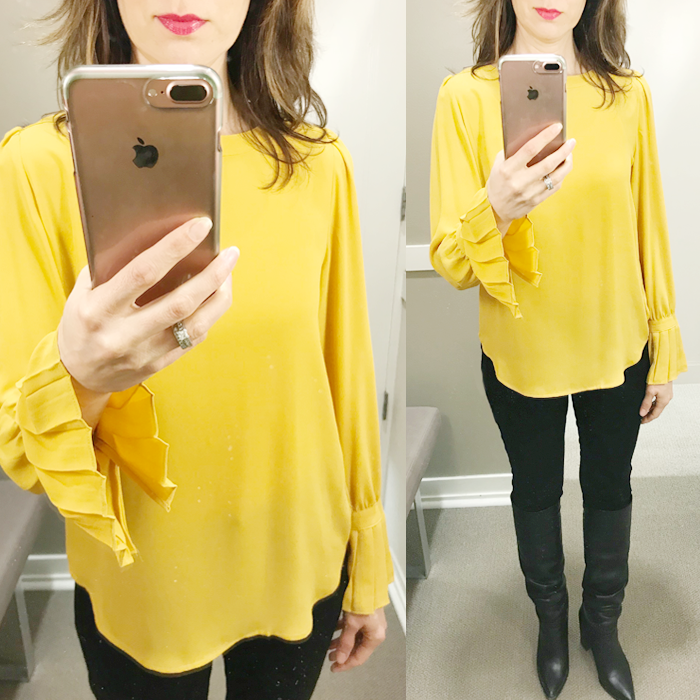 I adore yellow and floral, so I really like the tops here! I love the poppy top on you and the bright yellow puffer jacket looks great on you! and warm! I agree with you. The yellow sweater is a nice bit of sunshine in the winter. When I reach this point of winter, I always like to start wearing spring colors to cheer myself up! You always pick the best items! !